We are able to transfer all standards and variations of Digital Betacam, Betacam SX and MPEG IMX video tape to any file based digital video format from DVD to preservation 10 bit uncompressed Quicktime, AVI files or FFV1 lossless codec in an MKV container. We are able to transfer in the digital domain so no unnecessary decoding / encoding happens to the video. This format uses metal formulated tapes and we see few physical problems with the tapes at the moment as it’s a relatively new format compared to BetaSP or u-matic. Obsolescence through lack of machines and parts is low at the moment as this was a popular format used by many producers and broadcasters through the nineties and noughties. While the DVW range of machines has been designed with servicing in mind, earlier machines do suffer from capacitor problems though and spares, especially head drums, are frighteningly expensive. Headlife is related to the type of environment the machine was used in and many had hard lives being used constantly. 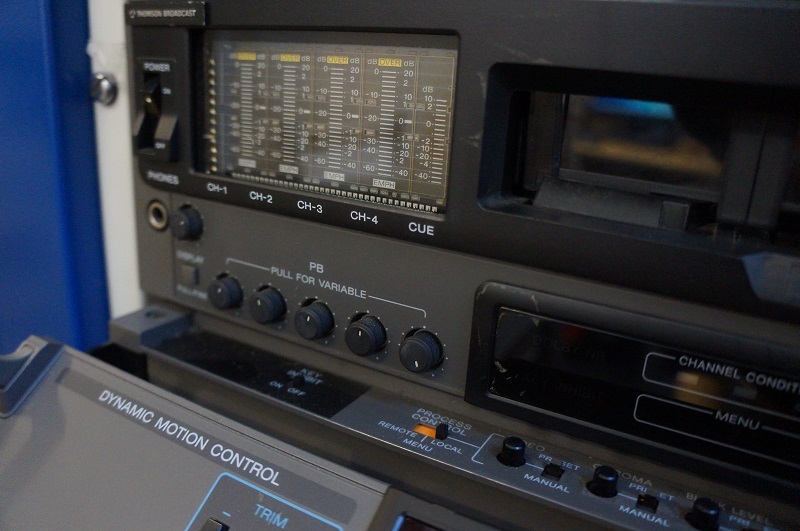 Given the hard life of many machines, the high price of spares and Sony’s policy on keeping spares for a limited time Digital Betacam may soon become threatened with obsolescence. Digital Betacam, a.k.a Digibeta or D-Beta, was introduced by Sony in 1993 as a replacement for the analogue Betacam SP format. Digital Betacam was superior in performance to DVCam and DVCPro, while being cheaper than D1. Digital Betacam attracted a fair amount of professional support but didn’t go as far as to become an industry standard like it’s predecessor. Cassette sizes are the same as other Beta versions: S (small) tapes record up to 40 minutes, L (large) tapes record up to 124 minutes. Cassettes are light blue. Digital betacam records component video with 10-bit YUV 4:2:2 compression. PAL resolution is 720×576, NTSC resolution is 720×480. The bitrate is 90 Mbit/s. There are 5 audio channels — 4 main channels (uncompressed 48KHz PCM) and 1 cue track. Some Digital Betcam equipment is backwards-compatible with Betacam and Betacam SP. Contact us now if you need to access or preserve your DigiBeta tapes.